AirAsia Press press conference backdrop at LCCT-KLIA. It is difficult not to love Dato’ Tony Fernandes, Group Chief Executive Officer of AirAsia, especially if one is a disabled person. Immediately after the protest by the Barrier-Free Environment and Accessible Transport Group (BEAT), Dato’ Fernandes personally met with members of BEAT to discuss the ways to resolve issues faced by disabled persons wanting to book seats to fly with AirAsia. AirAsia GCEO Dato’ Tony Fernandes giving his speech at the press conference at LCCT-KLIA. 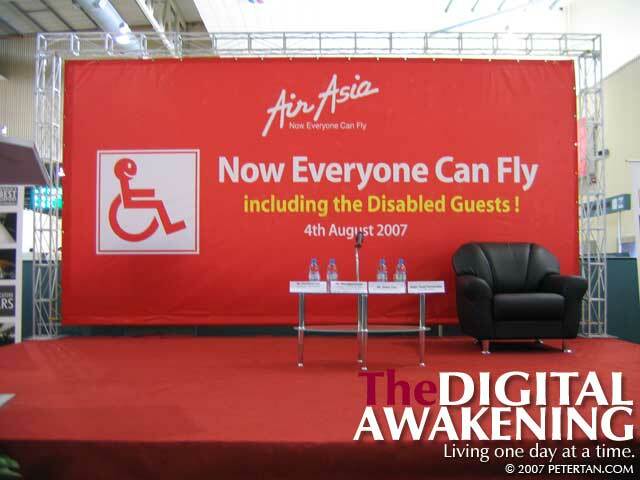 Following that meeting on July 20, AirAsia held a press conference yesterday (August 4, 2007) to officially announce the measures taken by the company to ensure that disabled persons will be able to fly with the airline. Dato’ Fernandes told members of the press and about 50 BEAT members who were present at LCCT-KLIA yesterday that AirAsia has purchased 2 ambulifts – one for LCCT-KLIA and the other for Kota Kinabalu International Airport – to ease the boarding and disembarking of people with reduced mobility and disabled persons. Members of BEAT at AirAsia’s press conference at LCCT-KLIA. He also announced the current fleet of AirAsia’s Airbus 320 planes and all planes in the future will be equipped with at least one aisle chair for the mobility of passengers. All toilets inside the aircrafts will be affixed with handle bars for the convenience of passengers. After the press conference, members of the press and BEAT were invited to test out an ambulift similar to the two that AirAsia have purchased and will be operational in 3 months. As part of the program to sensitise AirAsia staff on disability issues, Dato’ Fernandes invited BEAT to work with AirAsia Academy in training on those matters. He has offered to employ 3 staff at AirAsia’s call centre and a few more in guest relations positions. That was not all! BEAT Coordinator Christine Lee giving her speech at AirAsia’s Press press conference at LCCT-KLIA. Dato’ Fernandes has allocated space on the skin of AirAsia’s newest plane, the 50th in the fleet that we had the privilege to see yesterday, to prominently promote BEAT’s and disabled persons’ cause like what is being done with Manchester United and the Williams F1 Team both of which AirAsia is sponsoring. That is not all yet! He has also requested from BEAT a tagline, quote or slogan for the message to be carried by Rooney and Ronaldo, both players of Manchester United. How cool can that be? for resolving issues faced by disabled passengers. I was a skeptic – still a little skeptical until I see the ambulifts and fly with AirAsia – but I have to give it to Dato’ Tony for being the only public figure in Malaysia who has taken the problems faced by disabled persons seriously and openly addressed it immediately. He has set a standard for all other corporations and the government to follow in making Malaysia an inclusive society. I like most his attitude when he said to take a negative and turn it into something positive. the newest aircraft in the fleet at LCCT-KLIA. Syabas Dato’ Fernandes; Syabas AirAsia; and most of all Syabas to my fellow advocates in BEAT, especially Christine and Ragu for making this happen. The journey may still be long but this success with AirAsia has shown us all that with the right attitude, anything is possible and the sky may not even be the limit. Ambulift docking beside AirAsia’s newest Airbus 320. BEAT members watching a demonstration of the ambulift at LCCT-KLIA. BEAT members testing out the ambulift at LCCT-KLIA. chair from behind is AirAsia Executive Vice President Bo Lingam. Peter Tan trying to get into the toilet in AirAsia’s Airbus 320. AirAsia’s boarding stairs at LCCT-KLIA.